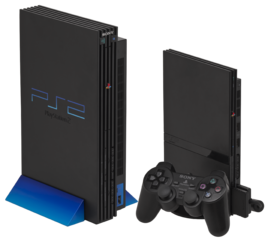 The PlayStation 2 (プレイステーション2), abbreviated to PS2 is Sony's second video game console and successor to the PlayStation. It was released in early 2000 as part of the sixth generation of video game consoles, and was the major competitor to the Sega Dreamcast, as well as the Xbox and Nintendo GameCube which followed. With over 155 million units and thirteen years of software support, the PlayStation 2 stands as one of the most successful video game consoles of all time. It was followed by the PlayStation 3 in 2006. See Sega Dreamcast hardware comparison for a technical comparison between the Dreamcast, PS2, GameCube and Xbox hardware. For most of its history, the PlayStation 2 dominated the video game landscape, being the most powerful console in the world at the time of its release, near-complete backwards compatibility with older PlayStation 1 games, the ability to play DVD movies (thus turning it into an inexpensive DVD player), and a dual-stick analogue controller with rumble features straight out of the box. Sony gathered strong third-party support from Japanese publishers, and succeeded in part due to the failings of its rivals - the GameCube's inability to attract older users, the Xbox's inability to break into Japan and the Dreamcast's inability to compete from a technical or marketing perspective. Brand awareness also played its part - the original PlayStation was a huge success, and customers were familiar with the name (the GameCube building the awkward history of the Nintendo 64, and the Xbox being completely new). Though the PlayStation 2 was more capable than the Dreamcast upon launch, it was soon displaced by its rivals from a technical perspective. Despite this, third party relations kept the system afloat for far longer than expected. Perhaps most notably is its Japanese record, in which PlayStation 2s continuously outsold the Xbox 360 despite being on the decline. The PlayStation 2 is most remembered among Sega fans for being the catalyst which forced Sega out of the home video game console market. Although the Dreamcast had over a year's head start over the PlayStation 2, it was haunted from day one by news of the PlayStation's successor, and was perceived to be the weaker console when the PlayStation 2 launched. Despite many critics proclaiming that the Dreamcast's library in 2000 far exceeded that of the PlayStation 2's, its sales were being outpaced by the PlayStation 2. As Sega's financial position deteriorated, and threats came from Microsoft and Nintendo, Sega announced its exit from the console hardware market entirely in January 2001, in order to focus instead on third-party software and the arcade market. Though Sega were keen to back the Xbox and GameCube upon release, the company's plans for the PlayStation 2 were subdued during the early years, receiving only a handful of Dreamcast conversions (including F355 Challenge, Rez, Ecco the Dolphin: Defender of the Future and Space Channel 5). Starting with the likes of Gungrave in late 2002, PlayStation 2 exclusives from Sega began to pick up, but never to the same level as the console's rivals. By the middle of the decade Sega prioritised multi-platform releases, the PlayStation 2 receiving its fair share of titles, and the longer lifespan of the console led to the PlayStation 2 receiving the most Sega-published games overall. Games like Virtua Fighter 4 and reboots such as the 2005 release of Altered Beast and the 2002 release of Shinobi were made exclusive to the platform, and Sega found itself producing several "budget" releases for the console, such as the 33-volume Sega Ages 2500 series. It also partnered with western publishers to release the likes of Destroy All Humans! and Killzone in Japan. The popular Yakuza series began its life on the PlayStation 2 before continuing on the PlayStation 3, though much of Sega's top PS2 output came after the demise of the Xbox and GameCube. In Europe, early Sega games were published by Sony Computer Entertainment, possibly due to Sega's difficult financial situation. This was ammended by the latter half of 2002. In Japan it was almost mandatory to support the PlayStation 2 as a third-party publisher, and particularly after the merger with Sammy, Sega found itself supporting the PlayStation 2 well into the next generation. Sega's relationship with the PlayStation 2 could be considered a marriage of convenience - more "cutting edge" games from the company were given to the Xbox, while family-orientated games were brought to the GameCube. Nevertheless, Sega supported the console until 2008, with over 150 games published for the platform over a seven year period. One of Sega's most important contributions to the PlayStation 2 library was the Sega Ages 2500 series of remakes of classic Sega games. Originally created as a partnership with D3Publisher, the series featured remakes and emulations of a wide variety of Sega games as early as Head On and as recent as Dynamite Deka, making it one of the most comprehensive compilation series produced by any company to date. Though the series would only be released in Japan, Sega brought a handful of the early volumes overseas in one package, Sega Classics Collection. Sega's WOW Entertainment also produced Vampire Night, a game for Namco that runs both on PlayStation 2-based arcade hadware and on the PlayStation 2 itself.